Most devout Aleheads worship at the altar of hops. Hops, of course, were historically used as preservatives, but the oily, little strobiles (thanks Wikipedia!) ended up bringing so much flavor to the party (copyright Alton Brown) that they have become the Ringo to water, malt, and yeast’s John, Paul, and George (I would call John the yeast…since he made the thing “go”, Paul would be the malt…he gave the band its heft, flavor and body, and George is obviously the water…kind of bland, but without him, you’re just chewing on some dry grains). Hops became so identified with beer production, that the German purity laws (what is it with the Germans and their obsessive need for “purity”?) listed hops as the only legal flavoring agent allowed in the creation of beer. 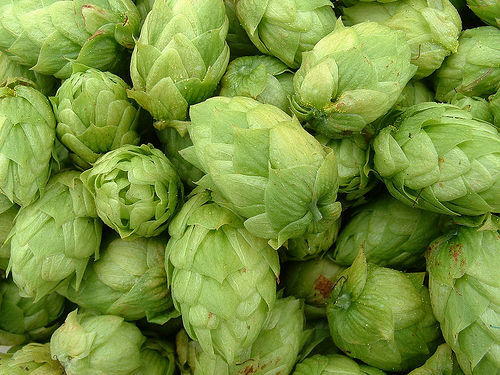 Because of their centuries-long association with brewing, most folks assume hops are simply an ingredient in beer-making (like bacon in a BLT, or bacon in a club sandwich, or bacon in a milkshake). What they don’t realize is that hops are actually quite optional. Many beers minimize their hop profiles or eschew the little buggers entirely (try a Lambic if you want to taste a hop-free brew). So what is a hop profile? It’s a difficult question since there are so many varieties of hops (a discussion for a later post). But in general, hops can make a beer taste floral, grassy, citrusy (probably not a word, but you get the idea), and above all else…bitter. Serving as a bittering agent is the key purpose of hops now that modern refrigeration has made the preservation of beer fairly easy. Aleheads got a kick out of those old Keystone commercials that mocked “bitter beers” since that bitter flavor is a key component to almost every style of beer. Of course, no one has ever argued that Keystone is a quality beverage. I always imagined that the Keystone brewery consisted of a bunch of guys sitting around drinking decent-quality lagers. Then, when they were good and drunk, they all pissed into empty bottles. Finally, they slapped a label on the bottles and sold their urine to the unsuspecting public as Keystone (which I always believed was an abbreviation for Kidneystone since there must have been a few rolling around in there considering the amount of piss). 1. Degree of Difficulty: Like trying to make chocolate with as high a percentage of cocoa as possible, upping the hop profile of a beer can be extremely challenging. Hops bring a lot of oils and chemicals to the brewing process and the more you put in your beer, the harder it becomes to brew something drinkable. Producing an insanely hoppy, but drinkable beer reveals the character of a brewer. It shows talent, dedication, and creativity. 2. Creating Inaccessible Beers: OK…this may be controversial, but I firmly believe that over-hopping beers can also be construed as a means of alienating the amateur beer-drinkers from the true Aleheads. Much like creating huge, robust wines that turn off novice oenophiles or abstract art so obscure that only the most dedicated art lovers care to see it, over-hopped beers are loved by only a select group of beer-drinkers. The pungent, bitter flavor turns off most drinkers, and these extreme beers are the very antithesis of “session beers” (brews that you can drink all day long without tiring of them). These are the beers that the elitists drink to prove they are more worthy than those that can’t stomach the overwhelming flavors. That last paragraph might make it sound like I’m against extreme hoppiness. Truth be told…I really like these beers in moderation. My fear is that every brewer is going to try to prove their worth to the beer community by creating these over-the-top beers…to the detriment of the other brews in their line-up. And of course, if you start an evening with an over-hopped beer, it can destroy your palate to the point that every other beer just tastes insipidly sweet. Hops are crucial to good beer-making. The bitter flavor profile they add is a vital aspect of almost every quality beer. Just remember that the best beers will balance the hops and the malt, the sweet and the bitter, the floral and the earthy. Try an extreme-hopped beer once in awhile, just to remind yourself how varied the world of beer can be (and to honor the brave brewer who made it). But don’t look down on those who find the beers too challenging to consume. Don’t roll your eyes at your significant other when they grimace after taking a sip of your 120 Minute IPA and ask “how can you drink this?” Remember, hoppiness isn’t for everyone, and there is plenty of room in the world’s beer tent for drinkers of all likes and dislikes. You may be a Double IPA fan and I may be a Scotch Ale fan, but the simple truth is…we’re all beer drinkers. Posted in Beer 101.Tagged 120 Minute, Bitter, Hop Devil, Hops, Hopsickle, Keystone. Aleheads? Can we use the term Hopheads instead? According to the venerable folks at Wikipedia, a Hophead is someone who appreciates highly hopped beers. Of course, it also means a user of something called cannabis, which I’m not familiar with. Must be some adjunct like rice or corn that speeds up fermentation. We probably need to come up with a new term. Hophead connotes the fans of another variety of stimulant. Although, I agree that Alehead is misleading since most of us enjoy a lager or two (or twelve). How about BeerBuffs? Or BeerLeaders? Or BrewBelievers? Hophead – One who enjoys the sticky, stanky, resiny qualities of…well…hops. Seriously, get your mind out of the gutter. BeerBuff – One who enjoys all things related to beer (Or most things, I don’t really care). Taste, history, technique, etc. Beer Geek – If you need a description, it doesn’t apply to you. You just know. Also, a correction is in store for my last post. Corn and Rice (As adjuncts) simply add alcohol to your brew without adding any real flavor other than some sweetness (The dream of the Crapumveriate). They do ferment quickly, since they’re simple sugars compared to other more complex sugars from traditional sources (Barley, wheat, rye), but they won’t actually speed up any fermentation. They sure do cut costs though, with a couple of pennies probably being passed onto the consumer at some point.